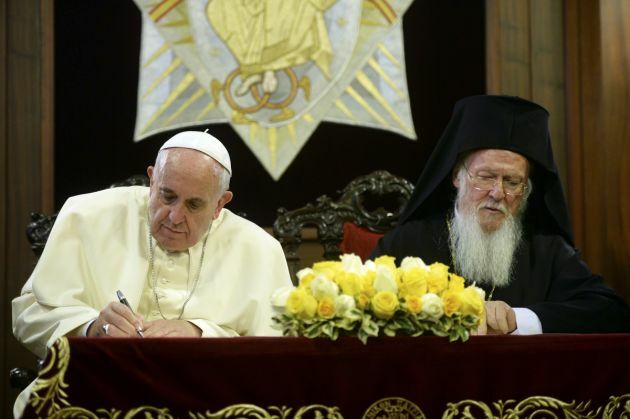 (Photo: REUTERS / Filippo Monteforte / Pool)Pope Francis (L) and Ecumenical Patriarch Bartholomew I sign a joint statement at St George church, the principal Greek Orthodox cathedral, in Istanbul November 30, 2014. Pope Francis began a visit to Turkey on Friday with the delicate mission of strengthening ties with Muslim leaders while condemning violence against Christians and other minorities in the Middle East. Pope Francis has welcomed three families of Syrian refugees who arrived in Rome after he rescued them from a camp in Lesbos following a visit to the Greek island to highlight the humanitarian crisis. Twelve people from the families of Syrian refugees boarded the pontiff's aircraft shortly at the end of his whirlwind April 16 visit to Lesbos. "We are are migrants," said the Pope during his visir. A deal between the European Union and Turkey on how to deal with with migrants and refugees has been ciritiicized as inhumane and even illegal. Some 3,000 people detained on Lesbos are highlighting the refugee crisis after the visit of Pope Francis and Orthodox Christian leaders. Francis visited the island with the spiritual leader of the Orthodox Christians, Ecumenical Patriarch Bartholomew I, and Archbishop Ieronymos II of Athens. "This is a sad journey. We're going to see a lot of people who are suffering and do not know where to go," said the Pope. " "We are heading for a meeting with the worst humanitarian disaster since the Second World War," the pontiff told reporters the Vatican Television Center (CTV) said, Sputnik News reported. Pope Francis gave Europe "a concrete lesson in how to treat refugees" by bringing the 12 Syrian Muslims to Italy aboard his charter plane, The Associated Press commented. Two of the families come from Damascus, the Syrian, while the third is from the stronghold of the fanatical group Daes, also known as ISIS, of Deir el-Zour in the north of the country, near the Iraq border. 'Today I renew my heartfelt plea for responsibility and solidarity in the face of this tragic situation," said Pope Feancis. The Vatican will take responsibility for supporting the families, while the Catholic Sant'Egidio community, which works with refugees, will take care of getting them settled initially. During his trip to Lesbos, Francis castigated people smugglers and arms traffickers, accusing them of aggravating Europe's current refugee crisis in Europe. Refugees wept and fell when the Pope came close to them while others chanted "Freedom! Freedom!" as he passed by. Lesbos lies close to Turky and has been a major gateway to Europe for many of those fleeing war and poverty in North Africa and Middle East. More than 80 aid groups are three assisting thousands of refugees on Lesbos, among them the UN's refugee agency UNHCR, the International Committiee of the Red Cross and the International Rescue Committee that operate transit and aid centers there.